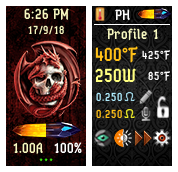 Thanks for the fix but I did go into escribe and remove the two battery gages then went into the mod settings and made sure in the battery tab that the drop down was set for 3 cell 18650 . It was already set correctly so I left everything go with the exception of removing the 4 fourth battery gages two in all. Everting is working flawlessly and I’ve tried other themes then go right back to yours. I’m done switching themes I really like this one there’s so many extras. The only thing I see that don’t seem quite right on my device is in the system page it shows the total of four batteries still which is probably because it’s the default. Does your update fix this even though it really is nothing . My device charges fast and last very long. Even though I usually like percentage of the battery on the main screen I really like the jewel that turns green to blue . Percentage of the battery I find on other screens but that’s just me. I want to thank you for all the work you put into this cool theme. I actually copy then pasted the battery percentage where the fourth battery was. wenn Du in Deiner Beschreibung unten auf "Dateioptionen" und dann "Details bearbeiten" klickst, kannst Du wieder das gewünschte Tumbnail für die Anzeige in der Übersichts-Liste der Themes auswählen. Dieses Procedere musst Du nach jedem Upload einer neuen Version wiederholen, da hierbei durch einen Fehler in der Foren-Software das Tumbnail verloren geht. If you click on "File Options" below in the description and then "Edit Details", you can select the desired thumbnail for the display in the overview-list of themes again. You have to repeat this procedure after each upload of a new version, because the tumbnail is getting lost by an error in the forum software. I just got a Rebel 250c . When I try to put the Gothic theme in it shows that I’m out of memory bit on my Triad I had no problems installing the Gothic theme. I don’t understand why they are different it is the same chip. Please help me understand why this might be happening. @Dougvapes If you're using SP17, I'd suggest you upgrade to SP18. Where do you find the download for SP18. I'm not sure what you mean by link in my sig? Thanks for the help got sp18. 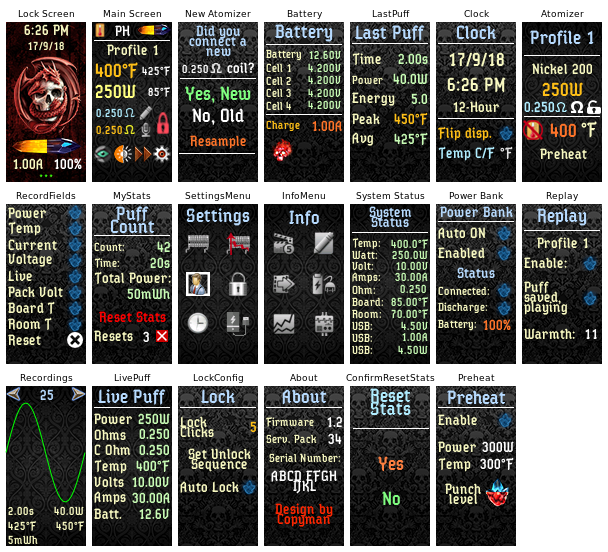 Got the Gothic theme loaded on the Rebel without any problem. Now I’m rocking with all that extra information that I very much was missing.